This is one of the most common subjects that permeates website owner —and digital publishing — forums online. Many are curious if their site is experiencing a personal drop in ad rates, or if everyone across the board is experiencing the same loss. Additionally, there seems to be a myth regarding a residual decline in ad rates for websites in general over the past few years. Both of these questions have really easy answers. Sometimes, finding these answers is really simple, other times, it’s a little more involved. However, I can probably help provide some pretty specific guidance and direction. 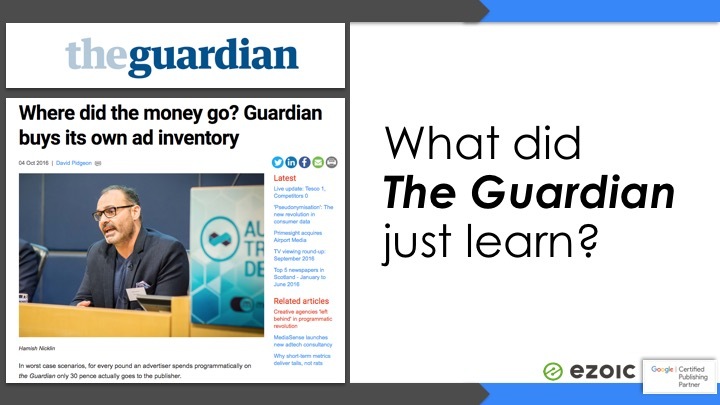 Below, I’ll show you how to know for sure if you’re site is seeing a loss in earnings, why it’s happening, and if others are seeing the same thing. Additionally, I’ll address the myth that online ad rates have been in steady decline over the years. This is a really common question and one that we’ve addressed a few times on the blog. However, I’ll help deliver all the possible answers and caveats here the best I can. If you’ve noticed a drop in ad revenue on your website you should start by doing your best to identify the cause. Here is a completely comprehensive guide for diagnosing the cause of a drop in ad earnings and solutions solving the respective problem (I highly recommend this, if this is your problem). Keep in mind, small drops that occur day to day could be related to a number of things like holidays, geopolitical events, and a number of other factors. However, if traffic is affected, the ad rates have dropped significantly, or have been occurring over a period of time, you should start at the link above. This is another question that can get kind of confusing without a true north. If you are constantly dealing in CPM’s, RPM’s, and the alike you may have a really hard to figuring out if you are actually doing better month over month. Additionally, if your traffic fluctuates at all, this can become exponentially more complex. The thing is, your RPM and CPM rates could be going up but your “ad rates” — or ad earnings — could actually be going down. The math behind this is something we talk about a lot and is actually pretty simple (see figure 1 above). You can read about how CPM’s and other advertiser metrics can make this overly complex here. 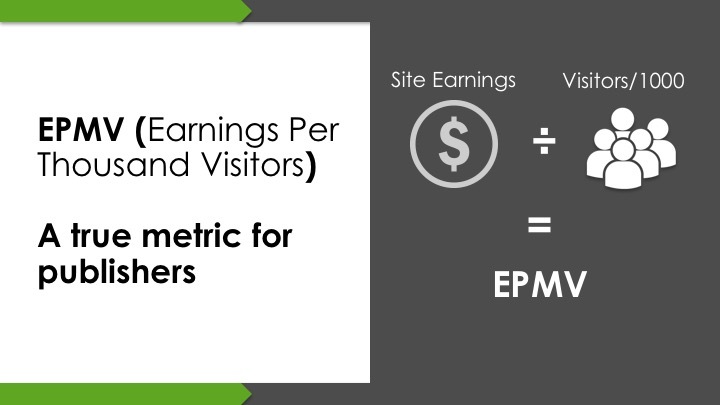 The best metric for seeing if you are actually getting the best ad rates — or just earning more per visitor — is by using EPMV (earnings per mille visitors). This is really simple, you measure your total earnings over a period of time and then divide that per thousand website visitors. Sound overly simplistic? Yeah, I think so too. Unfortunately, it really is the best metric for publishers to measure progress over time. If you’re EPMV is up week to week or month to month you are officially earning more money for your visitors. There are a lot of things that can affect this (see the list above), but generally, you want to be using this to keep ad networks and agencies honest. This is a daily question on webmaster and ad ops boards across the web. It’s rarely answered properly, and event if it was, you’d lack the context to know if another publishers data is relevant to your site. Every site has different types of visitors and caveats. Just because another webmaster isn’t seeing a drop in advertising rates doesn’t mean your site is alone in experiencing the issue and visa versa. What you want to look at is an index of thousands of diverse websites from across the globe. You can see a free index of how digital advertising rates — or earnings — by checking out the popular Ad Revenue Index. This will allow you to check for things like seasonality, industry trends, and the impact of significant geopolitical events. As I already alluded to above, this is a really common — and dangerous myth. Online advertising has never been more popular or more prevalent. Many people point to this growth as a reason for declines when the truth is that many sites have been seeing ad rates drop steadily for years because of a lack of evolution. A lot of this myth stems from many ad operations professionals and digital publishers failing to acclimate themselves properly to mobile trends over the years. Traditionally, when mobile first started to grow, publishers were truly making less on mobile than on desktop. But now, in most cases, publishers that have adapted properly are able to monetize mobile traffic the same as desktop. Unfortunately, most publishers and web professionals work on sites in a desktop format and view mobile traffic as secondary. The truth is, it is more common for a site to get the majority of traffic from mobile now. This is where a lot of this myth has stemmed from. Are you in this camp? Figure it out easily, look at your mobile revenue over the past 3 years. It should be going up, if it’s steady or going down, you might be in this group. Additionally, the advertising world is notoriously complex — and filled with a lot of intermediaries. This means there are more hands in the pot than ever. Publishers should be working to better understand who’s adding value in the chain of technology and network providers they use. The best way to do this is to test everything and avoid the “more is better” mentality (more meaning more providers and more ad tech). If you want to know if your site has a problem, I recommend using the guide linked at the top of the page. If you want to check your site’s ad rate against thousands of others, I recommend the Ad Revenue Index. If you still believe ad rates have been declining year over year, I’d be happy to discuss in the comments below. Anything I left out, keep the conversation going below.